Jet washing the patio. Looks spiffing, plus I made a right old racket for 2 hours. Friday morning, I was putting some washing out on the line and saw a red kite fly off from a tree in our garden. Whilst they are common flying over the centre of town where we live but never seen one in the garden. An hour later I went out for a run - and saw a heron take off from a neighbours garden. All in the peaceful quiet of the early morning. Kid's having his 5th birthday party a couple doors down. Loves his football, so they're having a kick around in their back garden. Massive row going on already, raised voices, wailing and crying from several kids. "HE WAS OFFSIDE!!!" "NO I WASN'T, IT'S 3-1!!!!" Gave the eldest a lift into college, and took the back road to Worcester through Elgar country. But best of all.........saw my first swallow of the year!!........ ( I know ....Warp's mum etc.etc.). Driving to Hackney Marshes yesterday, took us through Stamford Hill, my 11 year old son starts laughing 'look at that man' , 'whats wrong with his hair', 'look at that silly hat' ,hes shouts (windows down in the heat), 'there's another one, and another one!!' this went on all the way through, then again on the way back, whilst his mum was telling him to keep his voice down, made me chuckle at the innocence of a young boy from Hertfordshire seeing a new culture for the first time!!! orbital wrote: Driving to Hackney Marshes yesterday, took us through Stamford Hill, my 11 year old son starts laughing 'look at that man' , 'whats wrong with his hair', 'look at that silly hat' ,hes shouts (windows down in the heat), 'there's another one, and another one!!' this went on all the way through, then again on the way back, whilst his mum was telling him to keep his voice down, made me chuckle at the innocence of a young boy from Hertfordshire seeing a new culture for the first time!!! Upper Clapton & Stoke Newington, as well. It is very noticeable (the amount of Orthodox Jewish people walking around), the first time you go through those areas. It doesn't disturb me, they all seem very peaceful & law-abiding, if a little insular, but that may be wrong, on my part. I guess it may seem odd to a child, the first time on seeing. westham,eggyandchips wrote: Anti Semitic aged 11? samba wrote: Upper Clapton & Stoke Newington, as well. It is very noticeable (the amount of Orthodox Jewish people walking around), the first time you go through those areas.It doesn't disturb me, they all seem very peaceful & law-abiding, if a little insular, but that may be wrong, on my part.I guess it may seem odd to a child, the first time on seeing. It piqued my interest, so googled about it and found some interesting stuff, albeit a little odd! Finally finishing my Dissertation, 9 days before it is due. 11,569 words. Rather happy with it. warp wrote: bloke's an amateur. Are you saying we should have been looking up warp's bum for one of the rare, white chocolate ones? AnthraxDave wrote: Finally finishing my Dissertation, 9 days before it is due.11,569 words. Rather happy with it. Mega Ron wrote: Yep. Well done Dave. 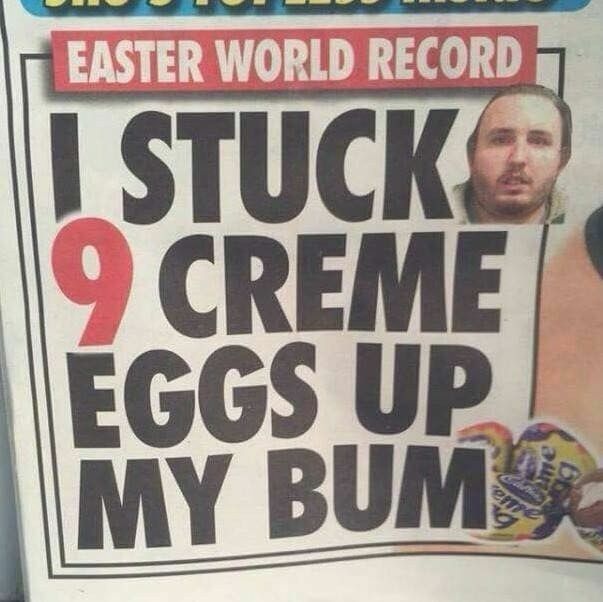 The corner shop has had to order more creme eggs. Not celebrating yet as I still have two other essays to finish.